BANFF, ALBERTA, Canada – At Snowy Owl Dog Sled Tours, we know you’re looking for that all-encompassing, complete and unforgettable Canadian Rockies experience. That’s why we offer so many options and add-ons to our dog sled tours. Customize your experience by choosing one or more of our outstanding extended tour options in Banff National Park. Ice Fishing: Willing to brave the cold in pursuit of that winning catch? Our ice fishing tours in Banff National Park provide you with everything you need to hook lake trout, white fish and other native species in the clear glacial waters of the Spray Lakes in spectacular Kananaskis Country. Let our professional ice fishing guides show you the ropes. This option is available on any overnight dog sled program free of charge. Snowshoeing: Our authentic snowshoeing tour add-on includes information about animal tracking and the local ecology. Experience the peace and quiet of a snowy winter walk. Two guest minimum. $40/person plus applicable tax. “Tails” of a Shaman: For a truly unique and offbeat experience in Banff National Park, be sure to add the Shaman tour featuring our very own wolf hybrid Shaman. Learn about the history, behavior and folklore of wolves as our charismatic leader takes you along the majestic Walk of Wolves. Open to adults and children over 12; participants must be in good physical condition to be able to hike the 3 km trail. $90/person. Igloo Building: Here’s an activity you’re not likely to find elsewhere. Traditional igloo building is a great group activity and team building exercise, particularly for corporate outings and young people. We give the tools and tips you need to build your own igloo. 10 participant minimum. $40/person plus applicable tax. 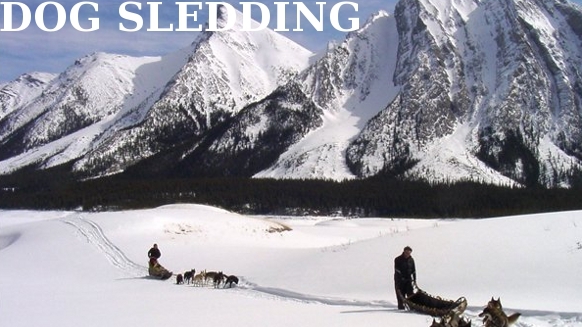 We also offer exciting meal options on our Banff National Park dog sled tours. Native Canadian Campfire Lunch: So you think you know how to eat like a real Canadian? Think again! Our traditional meal includes Buffalo deli smokies, fresh baked buns, traditional Indian bannock, smoked beef or salmon, maple syrup and chocolate mints. Served with spiced hot apple cider. $25/person plus applicable tax. Homemade Buffalo Stew: $10/person plus applicable tax. Gluhwein, traditional spiced hot wine. $6/person plus applicable tax.